An important conversation has occurred in the pages of the latest online edition of Violence Against Women exploring aspects in the work to prevent sexual violence and specifically efforts to engage bystanders. In the article titled, “Bystander Training as Leadership Training: Notes on the Origins, Philosophy, and Pedagogy of the Mentors in Violence Prevention Model,” Jackson Katz provides a comprehensive history of the long-running Mentors in Violence Prevention (MVP) program. Katz also highlights the importance of social justice-oriented approaches to preventing sexual violence that seek to change harmful social norms and critiques bystander strategies that focus solely on interrupting individual events without incorporating gender transformative conversations within their trainings. Over the years, engaging bystanders has become a common approach toward preventing sexual violence, especially on college campuses. There are numerous bystander intervention programs that at their core all seek to reduce incidence of sexual violence. 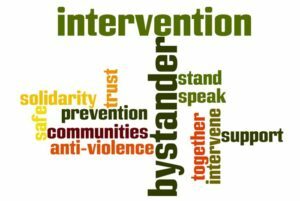 Bystander intervention approaches have helped shift efforts that focus exclusively on perpetrators and survivors to efforts that elevate the role that every member of a community plays in prevention. Three response articles on Katz’s commentary and a final response from Katz also appear in the journal. Ann L. Coker, Elizabeth Miller, and Elizabeth Wilmerding, Mari Knuth-Bouracee and Jeffrey L. Edleson authored these articles. The responses affirm the importance and place of social justice oriented efforts to prevent violence, while also raising important additional issues and questions. For example, Miller discusses how gender transformative programs challenge rigid norms of traditional masculinity making them a useful strategy to reduce sexual violence as well as homophobic bullying and sexual harassment. Miller says, “…the research on adolescent relationship abuse and sexual violence prevention point to key modifiable areas and approaches related to transforming gender norms, addressing homophobia, integrating with comprehensive sexuality education, and acknowledging the unique needs of youth already violence exposed.” Another point, raised by Coker, is that research can assist prevention practitioners in determining what prevention efforts are successful. Coker points out the importance of using data to inform the prevention strategies and approaches that are being implemented and discusses the acceptance level of communities as a context for finding what works. Wilmderding, Knuth-Bouracee and Edleson advocate for a comprehensive approach to prevention with multiple messages that reinforce each other to change culture and prevent violence. It is clear that sexual violence and related forms of violence are widespread, complex issues that require multiple prevention strategies and approaches. At the heart of prevention work is the need to change the factors that allow sexual violence to take place in the first place. Social justice seeks to address those factors and science provides us with the data and tools to get there. As we continue to learn more about what works to prevent violence, conversations such as this one between prevention practitioners, researchers, and advocates will remain necessary. Katz identifies the current social moment as a pivotal time to advance sexual violence prevention and this conversation is certainly part of that.